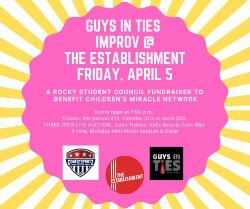 Guys in Ties Improv @ The Establishment! All ticket sales go to the RIHS Dance Marathon for Children's Miracle Network! Three-item Live Auction includes: 1 - Cubs Tickets (2 tickets for June 9th, Cardinals v. Cubs, game time 1 pm, pair valued at $178.00) Donated by Michael Matherly. 2 - Kids bicycle from Bike And Hike- Giant MOTR 20 C/B 2019, retails at $260.00, donated by RIHS Student Council. 3 - Thirty-minute Mini Photography Session donated by Mary Efflandt Photography ($250 value), and a 6-inch cake from Little Sweets Cake Design ($30 value).